Religion is as old as time itself. From Judaism and the ancient Eastern religions to the many facets of Christianity, many religions have stood the test of time, war, and cultural strife. In language that is easy to understand, The Everything World's Religions Book highlights the rich traditions, histories, and holy writings of diverse beliefs and traditions around the world. 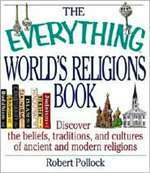 Whether you're a casual reader, student, or scholar, The Everything World's Religions Book helps you celebrate both the uniqueness of the world's religions, as well as their commonalities. You'll learn how these religions are practiced today, including the celebration of holidays, important religious leaders, and customs and practices.